A really nice piece on Calgary Cat. Such a sad loss. His photos were amazing. RIP, Mr. Anderson. Longtime Herald-Leader photographer Frank Anderson, 73, died Thursday at University of Kentucky Chandler Hospital. Anderson was a member of the Lafayette High School camera club when he joined the newspaper staff in 1960, working in the darkroom. He spent 42 years at the Herald-Leader, photographing the likes of John and Bobby Kennedy, Lyndon Johnson and Richard Nixon. He regularly captured the horses crossing the finish line at the Kentucky Derby and documented iconic moments in the history of University of Kentucky basketball, including Adolph Rupp’s last game at Memorial Coliseum. In 2003, Anderson won an Eclipse Award from the National Thoroughbred Racing Association for his photo of a runaway horse bearing down on jockey Patty Cooksey, who lay injured on the track at Keeneland as track personnel tried to help her. Horses...they find ways to break your heart even when they have the best of care. Condolences to Jeannine on the loss of Ashkal Way. Such a pretty boy. 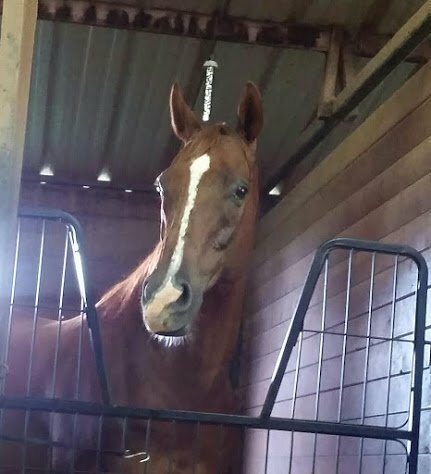 Condolences to Jeannine on losing her buddy, Ashkal Way. DEL MAR, Calif. – Jockey Martin Garcia miraculously escaped serious injury Tuesday morning at Del Mar when a filly he was working broke down while galloping out a furlong past the wire, then plummeted to the ground and rolled over top of Garcia. Exercise rider Darren Fortune died in a freak training accident on Woodbine’s main track Friday. Shortly after 7 a.m. Eastern, Fortune was on a horse who bolted while galloping out after a work and collided with another horse who was jogging the other way on the first turn. He was subsequently transported by paramedics to the hospital, where he died. No horses were injured. Fortune, 43, doubled as an outrider for Woodbine during the races and was a valued employee, according to Jamie Martin, Woodbine Entertainment’s executive vice president of racing. Fortune was the main exercise rider for trainer Nick Gonzalez. Discreetly Leah broke down in the 2nd race at Los Alamitos yesterday, pretty bad too. She was euthanized on the track. Copied over from my Facebook page, In Memory Of Our Racehorses. Date is written as day/month. 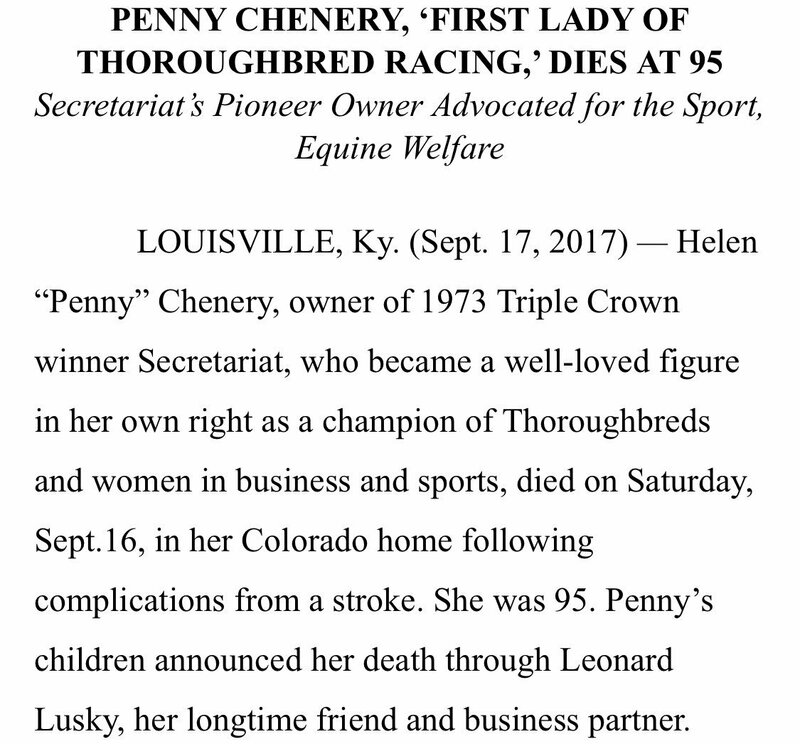 Penny (Tweedy) Chenery, Secretariat's owner & a powerful figure in horse racing, RIP. At age 95 she had a hell of a run, didn't she? Awful to learn of the passing of Penny Chenery, Secretariat's owner, beloved racing figure, from a stroke at age 95 on Saturday. What a life! Rest in peace! Sparrow Castle wrote: His photos were amazing. RIP, Mr. Anderson. I remember that race all too well and remember this incident on the first turn....it was my first race I'd ever seen at Keeneland, it was Bluegrass Stakes day, and I was there with several TBC forum members...was loving being at Keeneland but after seeing this race, which I recall was a middle level claiming race with mainly TP horses, I prayed the day wouldn't get any crazier. Stakes winner Top Fortitude after breaking down at Belmont during a claiming race. He was second to Bayern in the 2014 Woody Stephens. Last edited by Life At Zen on Thu Sep 21, 2017 3:59 pm, edited 1 time in total. I believe Top Fortitude broke down during a race this last Sunday, not in a workout.